Adopting a new puppy comes with excitement as well as responsibility and owners have many choices to make that affect the well-being of their new family member. One of the most important decisions to be made is the choice of puppy food. Puppies require a special set of well balanced nutrients suited for their growing bodies and energy levels. It is your responsibility as their caretaker, to ensure that the food you choose includes a combination of protein, carbohydrates, fats, vitamins, and minerals. Each of these nutrients plays a specific role in the growth and development of your new puppy. Owners, especially first time dog owners, should choose a dry dog puppy food based on the ingredients and how those ingredients compare to standards set by the Association of American Feed Control Officials (AAFCO) and the National Research Council. Dry puppy food is the best choice owners can make for several reasons. Dry food usually contains more meat protein. Protein aids in muscle growth and function and provides energy. Protein, usually from a meat source like chicken, fish, or even lamb should be the first ingredient in puppy food. These proteins will help repair any damaged cells and help grow new ones. A thirty percent protein content is what you should look for when shopping for the best puppy food. After protein, carbohydrates should also be a large part of the dry food you choose. Carbs give puppies quick energy and fiber which helps with digestion and elimination. 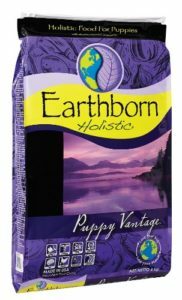 Earthborn Holistic Puppy Vantage is an excellent choice of dry puppy food with a twenty-eight percent protein content from chicken and whitefish. It also has a twenty percent fat content as well as carbs from sweet potatoes, brown rice, and barley. 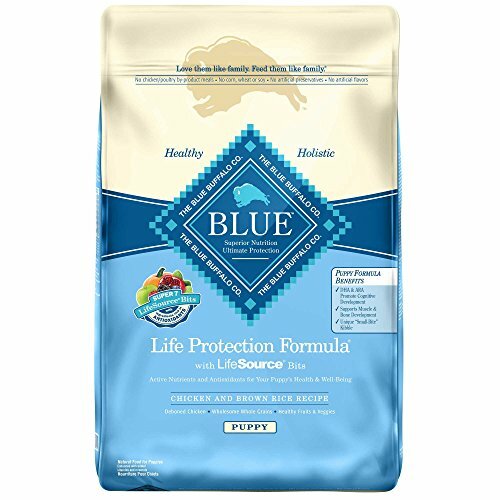 Blue Buffalo puppy food is also known for providing a high protein content from natural sources. The brand is known for its “life bits” which add nutrition to the dry food. Omega 6 and Omega 3 fatty acids are also needed to help a puppy mature properly. These fatty acids will keep puppy’s skin and coat healthy and shiny. Omega 3’s are also an anti-inflammatory which reduces itching and irritations caused by allergies and other factors including dry skin. Natural Balance Puppy Formula Dry Dog Food contains not only fresh meat based proteins but also the Omega 3 and 6 needed for puppies to grow. This brand boasts a total body approach to nutrition which includes a healthy skin and coat. Taurine is also included for healthy heart and eyes. A puppy’s mouth is smaller and puppy food is designed for that. 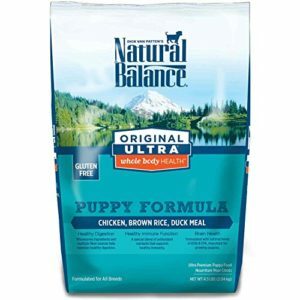 Natural Balance is shaped specifically for puppies to be able to chew it easier. This will also aid in digestion. New puppy owners must also consider the breed of their puppy. Small breeds do not have the same nutritional requirements as large breeds. A Chihuahua does not grow the same way a Great Dane does and owners should consider the size of their puppy when choosing a dry puppy food. Small breeds metabolize food quicker and need to be fed three to four times a day and their food needs at least a fifteen percent fat content. Wellness Complete Health Natural Dry Puppy dog food has about eighteen percent fat content. Its main ingredients are de-boned turkey, chicken meal, and oatmeal. Blue Buffalo also has a dry puppy food specifically for small breeds. Medium breed puppies will mature to be twenty to fifty pounds and their nutritional needs are not as complicated as very small or very large breeds. However, they still require twenty-two percent protein and ten percent fat. Wellness and Blue Buffalo have dry puppy dog foods that meets these requirements. Taste of the Wild also offers a medium sized breed puppy food with bison, lamb meal, and sweet potatoes as its main ingredients. Large breed puppies usually grow to be well over fifty pounds when they mature and need a puppy food to support slow steady growth. Their food does not have to be as energy dense, but needs to support their rapidly growing bodies to prevent health conditions like hip dysplasia common in large dogs. Eagle Pack Pet Food for Large and Giant Breed has lamb meal, ground brown and white rice as its main ingredients and it suggested for larger puppies. Natural Balance, Taste of the Wild, and Wellness brands also have dry puppy dog food specifically for large breeds. Choosing a dry puppy food can seem like an impossible task to a new owner. Speak to breeders, experienced owners, and your vet to help you make the best choice. Choose your puppy food based on ingredients, not the brand name or the price. Many generic brands may only meet minimum requirements, but choosing an expensive brand simply because it is expensive does not mean it will have the nutrients your puppy needs. For more information on what dry dog food to feed your dog, feel free to read our article on the best dry dog food brands we wrote. Or alternatively the best dry dog food for aging dogs.